﻿ The Canon EOS R full frame mirrorless camera now already released, and in stock and shipping at most US stores. Canon Europe has interviewed Canon Ambassador Brent Stirton talking about the new Canon EOS R (Amazon/B&H/Adorama) at Photokina 2018. You can watch the full video above. Canon EOS R (B&H/Amazon/Adorama) is Canon’s first full frame mirrorless camera announced on September 5th, 2018. EOS R supports UHS-II memory card, which means you can get fast read and write speed. Currently, Sony, Lexar, SanDisk are produce UHS-II memory cards. Below are a list of top recommended UHS-II SD memory cards for Canon EOS R full frame mirrorless camera. Canon EOS R (B&H Photo Video/Amazon/Adorama/Focus Camera) now finally available for pre-order online. The demand of this camera seems very high, so you need to order ASAP to get shipped first. Author adminPosted on September 12, 2018 Categories Canon EOS R, Canon Full Frame Mirrorless LensesTags Canon EOS R In Stock Tracker, Canon RF 24-105mm f/4L IS USM Lens, Canon RF 28-70mm f/2L USM Lens, Canon RF 35mm f/1.8 Macro IS STM Lens, Canon RF 50mm f/1.2L USM Lens, Pre-orderLeave a comment on Canon EOS R & RF Lenses Full Pre-order Links Now Live ! Author adminPosted on September 2, 2018 September 2, 2018 Categories Canon EOS R, Canon FF RumorsTags Leak, Photokina 2018, SpecsLeave a comment on These is Full Specs List of Canon EOS R Full Frame Mirrorless Camera ! Here are basic specs 4 new RF lenses for the Canon EOS Rfull frame mirrorless camera. The RF 28-70mm f/2L USM lens weight is 1,430g, similar as new EF 70-200mm f/2.8L IS III USM lens (1,480g). Here are First Images & Specs of Canon EOS R & 4 New RF Lenses ! 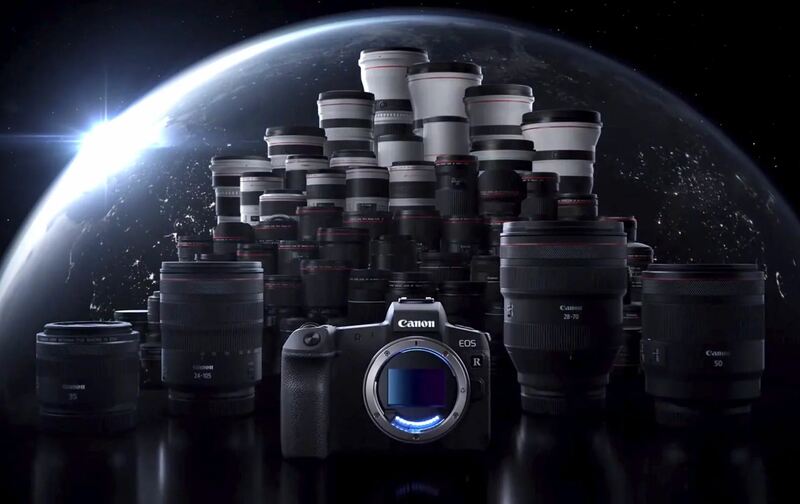 Author adminPosted on September 1, 2018 Categories Canon EOS R, Canon FF Rumors, Canon Full Frame Mirrorless LensesTags Canon RF 24-105mm f/4L IS USM Lens, Canon RF 28-70mm f/2L USM Lens, Canon RF 35mm f/1.8 Macro IS STM Lens, Canon RF 50mm f/1.2L USM Lens, Image, Leak, SpecsLeave a comment on Here are First Images & Specs of Canon EOS R & 4 New RF Lenses ! Canon EOS R, RF 50mm f/1.2L, RF 28-70mm f/2L, RF 35mm f/1.8, RF 24-105 Confirmed ! It is now confirmed that Canon will announce their first full frame mirrorless camera next week on September 5th. The name of Canon full frame mirrorless camera is Canon EOS R as rumored before. Below are full list of new products to be announced next. Author adminPosted on August 31, 2018 Categories Canon EOS R, Canon FF Rumors, Canon Full Frame Mirrorless LensesTags Canon RF 24-105mm f/4L IS USM Lens, Canon RF 28-70mm f/2L USM Lens, Canon RF 35mm f/1.8 Macro IS STM Lens, Canon RF 50mm f/1.2L USM Lens, M Adapter R, Photokina 2018Leave a comment on Canon EOS R, RF 50mm f/1.2L, RF 28-70mm f/2L, RF 35mm f/1.8, RF 24-105 Confirmed ! A Canon RF 24-70mm f/2 Lens will be Announced Along with EOS R ? First rumored yesterday, the Canon EOS R full frame mirrorless camera is to be announced on September 5th. Now according to CR, a new lens called Canon RF 24-70mm f/2 lens is also rumored to be announced along with Canon EOS R.
Author adminPosted on August 30, 2018 Categories Canon EOS R, Canon FF Rumors, Canon Full Frame Mirrorless LensesTags Canon RF 24-70mm f/2 Lens, Photokina 2018Leave a comment on A Canon RF 24-70mm f/2 Lens will be Announced Along with EOS R ? According to latest rumors, the first Canon full frame mirrorless camera could be named Canon EOS R. It is rumored to have a 24MP or 28MP full frame mirrorless sensor. It will compete with current Sony a7 III and Nikon Z6.